Large freshman enrollment growth was evident among the nation’s racial and ethnic minorities. Overall freshman enrollment was up 6%. Hispanic freshmen increased by 40,000 compared with 2007, a 15% increase in enrollment and the largest of any of the major racial/ethnic groups.4 In comparison, freshman enrollment of black students increased by 8% and of Asians by 6%. White freshman enrollment increased 3% over 2007. Not all college and universities are the same, and an important distinction concerns which colleges and universities the additional minority freshmen attended. Minority college students are concentrated at two-year colleges and less-than-two-year institutions in comparison with their white peers (National Center for Education Statistics, 2010b). Among undergraduates at four-year colleges and universities, minority undergraduates on average enroll at the less academically selective institutions compared with white undergraduates (Alon and Tienda, 2005). The recent large increase in minority freshman enrollment was not disproportionately concentrated in the lower tiers of postsecondary education — that is, two-year colleges and less-than-two-year institutions. Total freshman enrollment increased by 144,000 students. White freshman enrollment increased by about 39,000 over all post-secondary institutions, so white freshmen accounted for about 27% of the freshman increase. The increase in white freshmen did not disproportionately occur at four-year schools. Total freshman enrollment at four-year institutions increased by about 55,000 freshmen, of whom only about 12,000 were white. So white freshmen accounted for about 23% of the freshman growth at four-year colleges and universities. Alternatively, nonwhites accounted for about 73% of the freshman growth throughout postsecondary education and about 77% of the growth at four-year schools. Another way to grasp “who went where?” is to examine the racial composition of the freshman cohorts in each year. In 2007, whites made up 55% of the freshmen at less-than-four-year institutions. 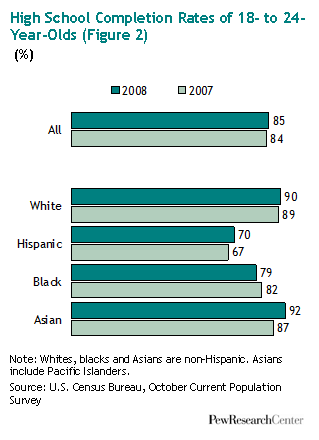 In 2008, whites were only 53% of the freshmen in these lower tiers of post-secondary education. But, at least in terms of broad tiers or categories of higher education, whites were less prevalent everywhere. In 2007, whites constituted 64% of the freshmen at four-year colleges; by 2008, the white share of freshmen at four-year schools had diminished to 62%. Given lag times in the availability of data, it is difficult to fully disentangle all the causes of the growth in minority freshman enrollment since 2007. For example, one possible explanation is that there has been a disproportionate increase in the number and share of minority students among the nation’s high school graduating senior classes. The most authoritative figures on the characteristics of high school graduating classes are compiled by the National Center for Education Statistics (NCES), but as of April 2010, the most recent school year for which NCES had published such data was 2006-2007. However, Census Bureau household surveys provide more timely snapshots that allow for an examination of a closely related indicator: the number of 16- to 24-year-olds who completed high school in the calendar year of the survey. And, indeed, these data indicate that minority youth accounted for much of the growth in the number of 16- to 24-year-olds who recently completed high school. From October 2007 to October 2008, the total number of recent high school completers increased by about 200,000. The estimated number of white recent high school completers increased by about 47,000 over that period, so whites accounted for only about 24% of the growth in the stock of young high school completers. These data strongly suggest that the minority freshman college enrollment spike that occurred from 2007 to 2008 is closely related to the minority high school completion spike that occurred the same year. The number of recent Hispanic high school completers grew by 29% from October 2007 to October 2008, according to the Census Bureau household survey. There are more Hispanic college freshmen in part because more Hispanic youths are finishing high school.